TAMPA PRESERVATION, INC. – Page 48 – "Saving Yesterday for Tomorrow"
Of the 28 Landmarked historic resources in unincorporated Hillsborough County, three are representative of African-American community history. These Landmarks were celebrated this April during the University of South Florida Institute on Black Life’s Spring Symposium. The Symposium is an annual event that honors local African-American life and history. The Beal-Holloman House and the Glover School are located in Bealsville, which is southeast of Plant City, just north of SR 60 near the Polk County line. Bealsville was founded by former slaves from the plantations around Springhead after the Civil War. The founders were able to acquire land through the Southern Homestead Act of 1866. To retain title, the claimants had to construct homes, clear the land, and procure farming implements. The community was originally named after Howell’s Creek, and for a while it was called Antioch. In 1923 the name was changed to Bealsville after Alfred Beal, son of one of the community’s founders, Ms. Mary Reddick. Mr. Beal was savvy in real estate and owned a large amount of land in this area. When property owners in the area had defaulted on mortgage or tax payments, Mr. Beal bought the property and resold smaller lots back to Bealsville residents. This began the pattern, which continues today, of keeping the Bealsville property in the hands of local families. Mr. Beal donated acreage for a community school, church, and cemetery. He also gave his daughter, Beulah Estelle Beal Holloman, the land for her house. Ms. Holloman was a prominent midwife in Bealsville. 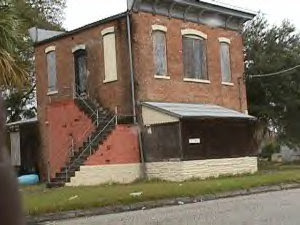 The Beal-Holloman House was continuously lived in by Mr. Beal’s descendents until about 15 years ago, when it was boarded up. However, the property remains in the family. The great-granddaughter of Alfred Beal is the current property owner. In 1873 the community built a one room log cabin school that educated the children of Bealsville for the next seventy years. This school originally was named Antioch School, but it was later renamed Jameson School. The Glover School was built in 1933, on land donated by William Glover. The original Glover School was a three-room wood frame school house. The residents of Bealsville fought for several years to get a larger school, since education, along with religion, was one of the most important principles to the community founders. Once Mr. Glover donated the land and the community had raised $1,000, the school district agreed to construct the new three-room school house. In the mid-1940s, several of the County’s smaller schools were consolidated. The schools for African-American children in nearby Keysville, Hopewell, Coronet, and Trapnell were closed, and the Glover School was expanded with the concrete block buildings you see in the center and left of the photo. There are an additional three other buildings at the school site, added over the years. Glover School remained segregated until 1972. The school was closed in 1980, and Bealsville, Inc. was formed and took over the property to use for the benefit of the community. In addition to being a Hillsborough County Landmark, the Glover School is also listed in the National Register of Historic Places and is on the Florida Black Heritage Trail. The Citrus Park Colored School was one of the early one-room school houses to not survive consolidation. The first school for African-American children in this part of Hillsborough County was located further north along Gunn Highway, in a Methodist church on property owned by Mr. Tony Lewis, a former slave from Mt. Dora. The original school building was struck by lightning and burned. In 1921, Ms. Barbara Allen donated the land for a new school, and with considerable help from Reverend Charlie Walker who persistently petitioned the school board to establish the school, the Citrus Park Colored School was opened by 1925. This building was also used for services by a Baptist church and the Mt. Pleasant AME Church through the early 1950s. The school was closed in 1948 and deeded to the church at that time, and the students were sent to school in Sulphur Springs. Progress Village is not a Hillsborough County Landmark, but it is an example of a valuable historic resource from our recent past. Progress Village was first platted in 1958, which now falls within the standard 50 year time frame in which cultural resources can begin to be considered historic. In addition to being a historically African-American neighborhood, Progress Village is one of the oldest planned communities in the unincorporated County. Progress Village was constructed to provide homes for families dislocated from the Scrub neighborhood in Tampa during urban renewal and interstate construction. Less than a quarter of the planned 3,857 residences were constructed, but in 1960 the non-profit Progress Village, Inc., with its interracial board of trustees, was awarded the national Lane Bryant Service Award for outstanding contribution to community life. In addition to the houses, a school, shopping center, and two churches were constructed in Progress Village. The Second Annual TPI Historic Schools Tour was held on Saturday, April 19th. This year’s tour included Plant High School, Roosevelt Elementary, Gorrie Elementary, Mitchell Elementary and Wilson Middle School. Everyone met at Plant and hopped on a yellow school bus for an “authentic” experience. Each Principal greeted participants, took them on a tour and shared their facility’s unique history. Assistant Superintendent of Facilities Cathy Valdes informed the group that the Hillsborough County School District has the second largest inventory of historic schools in the state and is the largest steward of historic properties in the county. What a huge responsibility! Tampa Preservation’s own Paula Meckley was a featured speaker at both Wilson and Mitchell where she has taken her knowledge and skills as a preservationist and put them to work. Whether procuring and installing salvaged wood floors or writing grants to fund a new lunchroom at Mitchell, Paula can’t be stopped! Everyone was inspired by her stories and enthusiasm. She is proof that preservation works. 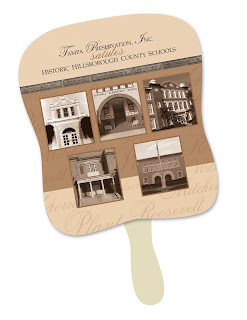 As the yellow bus pulled into the Plant parking lot everyone received a Tampa Preservation Salutes Historic Schools poster. Old friends visited and new friends were made on the short outing. Something about “going back to school” is special for everyone. Don’t miss the Third Annual Historic Schools Tour next year! The 2008 Awards Celebration was held on April 11 at the historic Italian Club in Ybor City. Sponsors of the event were L’Unione Italiana and Southern Spirits and Wine. The event was part of the AIA Heritage Committee ReNew Tampa Conference. Serving on the Awards Jury were Roger Grunke, AIA, Bob Jefferies, AIA, Gus Paras, AIA along with TPI Board Members Becky Clarke, Beth Strong, and Nootchie Smith. Many thanks for their hard work! The Berriman-Morgan Cigar Factory – 1403 N. Howard Ave.
An Individual Achievement Award recognized Nancy Henderson for her artistic pen and ink drawings of Tampa’s historic buildings. Her renderings have promoted an awareness of and appreciation for Tampa’s architectural heritage. An Organizational Achievement Award was presented to the Tampa Fire Fighters Museum Board of Directors’ commitment to the restoration of and sensitive expansion to Old Fire Station # 1. The members’ determination over came multiple difficulties that fired up during the ten year evolution. Certificates of Appreciation were given to Elaine Lund for her contributions to the TPI newsletter Cornerstone and to Richard Clarke for countless years of his photographic documentation of TPI Events. Hillsborough County’s archaeological resources include prehistoric campsites, burial mounds, shell middens, quarries and manufacturing sites for tools, along with historic archaeological sites, such as Fort Foster. Scattered artifacts, usually tools or fragments of pottery, are the most common indicators of an archaeological site. Most of the identified archaeological resources in Hillsborough County date from the Archaic Period (7500-500 BC). The second most common type of identified archaeological resources in this County dates from the historic periods. Fort Foster State Historic Site, part of Hillsborough River State Park, is considered a historic archaeological site. While the original fort buildings are no longer standing, there remains a wealth of historic artifacts in the ground. Fort Foster, established in 1836 and abandoned in 1849, safeguarded the Fort King Military Road Bridge over the Hillsborough River during the Second Seminole War. Today the park contains a replica of the fort and an interpretive center. Florida’s archaeological resources, the material remains of past human life or activities, date back approximately 10,000 years. An archaeologist can study the way found artifacts are placed in relationship to one another and to the natural environment to determine information about the way past people lived. By studying the context of the site, an archaeologist can determine what people wore, what kind of food they ate (and how they got the food), who they interacted with, and other details about how they lived. Because much of this information can only be determined by the context in which the archaeological resources are found, it is important to provide a high level of protection for these irreplaceable resources. In Florida, it is illegal to dig for artifacts without the landowner’s permission, and digging for artifacts on state lands without a permit is a third degree felony. It is also illegal to knowingly disturb, buy, or sell human remains. Florida Statutes govern the treatment of unmarked human burials. Due to the sensitive nature of these sites, the locations of archaeological resources are exempt from the Sunshine Law. Projects that receive state or federal funding, such as road widening projects, must survey for archaeological and historic resources before work begins to ensure that these resources will not be negatively affected by the projects. This also applies to projects that take place on state and federal lands, such as parks. Florida’s rapid and intensive land development poses additional challenges for these often “invisible” sites. Unfortunately, archaeological resources are often not discovered until they have been negatively affected by development activity. A cultural resource assessment survey of a development site prior to construction activity can determine whether significant archaeological resources are present. One of the goals for 2008 of the Hillsborough County’s Historic Resources Review Board (HRRB) is to identify archaeological resources in the unincorporated County that are eligible for Landmark designation. Landmark-eligible archaeological sites will be listed in the County’s Historic Resources Inventory. Once listed in the Historic Resources Inventory, these archaeological sites will receive some protection. The HC Land Development Code requires that when development permits, development orders or other development approvals affect or abut the properties on the Inventory, the HRRB can review and comment on the applications. The HRRB’s comments are not binding, but are an opportunity to work with the property owner to provide the best possible outcome for significant sites. Upon Landmark designation, a Certificate of Appropriateness from the HRRB is required before archaeological resources can be altered. When making a decision on an archaeological resource, the HRRB considers methods to avoid, reduce or mitigate adverse effects on the archaeological features, while taking into account the current needs of the owner. Property owners of Landmarked sites in unincorporated Hillsborough County are eligible for a variety of benefits, including a preservation plan for the long-term maintenance of their Landmarked property, and economic incentives, including matching grant funds for HRRB-approved projects and a property tax exemption for the value of HRRB-approved improvements. Landmark sites are also eligible for a transfer of development rights, which may reduce the taxable value of the property. Conservation easements allow property owners anywhere in Florida to protect their archaeological resources, regardless of whether they are listed in the National Register of locally Landmarked. A conservation easement restricts the use of their land through the property deed, protecting the archaeological site from development activity. This restriction can lower property taxes and estate taxes. Additionally, property owners can receive a federal income tax deduction if they donate an easement for conservation purposes in perpetuity to a qualified organization such as an historical society or a land trust. Conservation easements can be written to address the unique needs of the individual property owner. Owners of property that contains archaeological resources can also seek Archaeological Landmark designation from the State of Florida. This designation provides extra protection to sites that are eligible for listing in the National Register. A permit from the State is required before anyone is allowed to dig at a State Archaeological Landmark. Port Tampa City, known earlier as Passage Point or Black Point, was established in 1893 at the end of a Henry Plant Railroad spur line. Early Port Tampa history revolved around the Plant System of railroads, hotels and steamships, serving as a steamship port to Cuba as well as home to several hotels. Absorbed by the City of Tampa in 1961, Port Tampa still has a small town atmosphere secluded from Tampa’s city life. The area retains much of its historic charm with brick streets, 1926 marble Port Tampa City Library, quaint churches and historic homes. In addition, the area capitalizes on its environmental assets with Tampa’s Greenways Trail and Picnic Island, featuring a beach, boat ramp, fishing pier, and bird sanctuary. Within this setting is a threatened piece of architecture inherently tied with Port Tampa history known as the FitzGerald Building. The building was built by Captain James W. FitzGerald, a stockholder of the Peoples Line Steamers and Superintendent of Plant’s steamship line. FitzGerald was captain of the steamboat h. b. plant from 1880 to 1886. Captain FitzGerald arrived in the area that was to be Port Tampa City in 1885 and partnered with Charles W. Prescott of Erie, Pennsylvania. Together they purchased a section of land that they platted with the streets and blocks of the town, then chartered as Port Tampa City. Captain FitzGerald and Mr. Prescott, along with sea captain Henry G. “Harry” Warner, also formed the Port Tampa Building and Loan Association.According to City of Tampa property records, the FitzGerald Building was constructed in 1890. Approximately 1,300 sf, the brick building is two-stories high and has a pressed metal cornice. All indications are that it was built as the Captain’s place of business, although no official documentation has been found. The Sanborn Fire Insurance Co. map of 1899 depicted the footprint of the FitzGerald Building as it stands today. Mrs. FitzGerald died in 1904, Captain FitzGerald died in 1909, and the heirs retained ownership of the property until 1944. Thus, the FitzGerald family owned this particular piece of land for 51 years. The building then went through a succession of owners who utilized the building for various commercial and residential uses. One owner, with plans for a nightclub, gutted the building interior, but never completed the remodeling. The current owners, Mr. and Mrs. Edward Devoe, purchased the Fitzgerald Building in 1976, to use for equipment storage for their contracting business. The building has been vacant since the Devoe’s retirement and is now in need of stabilization to prevent further deterioration. A developer planned to purchase the property a couple of years ago, with intentions of demolishing the building; however due to the historic significance of the building, the demolition request was denied. 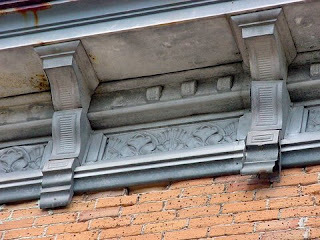 The FitzGerald Building is the oldest surviving business structure in Port Tampa City and is worthy of preservation. The Devoes acknowledge the historic significance of the property and are supportive of the efforts to preserve the building; however, they are eager to sell the property. Local residents are working with the Devoes and community preservation groups to find ways to save this important historic Port Tampa building. For more information, contact Carol Curtiss at Cabacur@aol.com or (813)831-1985. Article provided by Carol Curtiss. The Preservation Roundtable meets on the first Wednesday of every month at Union Station to share information regarding preservation related issues in the Tampa Bay area. Local government representatives and interested citizens are encouraged to attend in order to better coordinate local preservation efforts. For more information, contact TPI at (813) 248-5437 or tpitampa@aol.com. Detectives are working to develop leads in the case. The damage was caused by a heavy object, maybe a sledgehammer, police say. If you own a house built before 1960 that has its original windows, be grateful. Nothing will ever look as beautiful or work as well.